Access to open space is crucial in high density neighbourhoods so understandably residents using Ward Park are concerned about what happens when their open space it is not available. 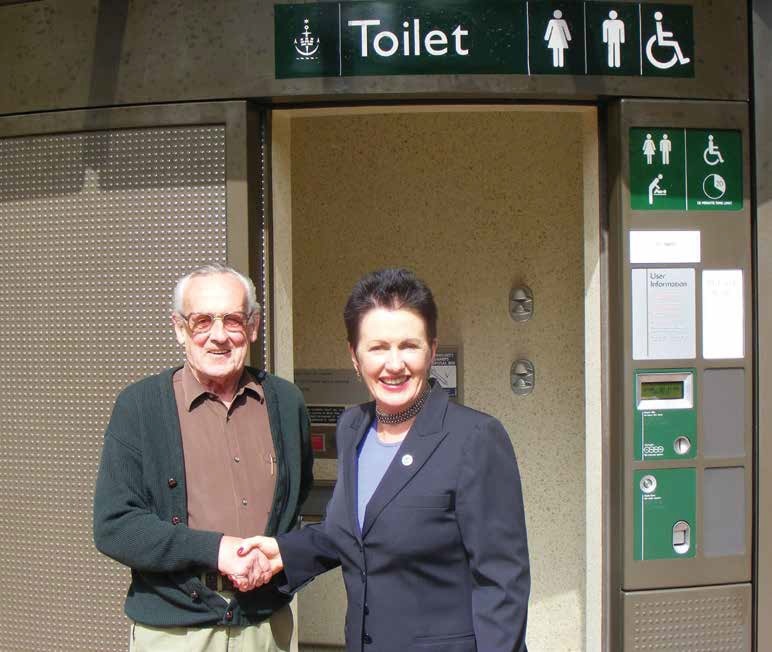 Lord Mayor Clover Moore with Tenant Representative Rick O’Meara at the Ward Park Public Toilet opening. There is much research that shows the positive link between green space and health and wellbeing. This is most apparent among the elderly, people who spend most of their time at home, and those from lower socioeconomic groups. Scott Weich and others have shown a prevalence of depression associated with features of the built environment, especially for those living high-rise dwellings. One place full of elderly and those not so well off is the John Northcott public housing estate in Surry Hills. The majority, 93% in fact, of the tenants are on either an Aged Pension or a Disability Support Pension. Those residing at Northcott live in densely populated high-rise buildings, the estate consisting of over 600 small one or two bedroom units. Essential to the health and well-being of the whole local community, but especially for the more vulnerable, frail and aged or disabled is what the tenants refer to as their backyard, Eddie Ward Park or as it is commonly called Ward Park. Currently, Ward Park has a range of outdoor equipment including two playgrounds, a flying fox, skate bowl, ping-pong table and two free BBQs. It is also the only 24 hour off-leash dog park within easy reach for those with companion animals. A wide and varied bunch of people utilise the space including dog walkers, parents and children, sun-bakers, book readers, skateboarders, kite-flyers, exercisers who run the gamut from gentle movement like Tai Chi to those doing more rigorous boot camp style activities. It is a place of refuge and respite. The park plays host to the annual Northcott Pet Day which attracts hundreds of people and their pets to the park. In October, it is also the venue for a Mental Health Month event and throughout the year the City of Sydney holds Good Neighbour BBQs. These activities all encourage social interaction and community engagement. Ward Park has always had the ability to bring the community together. In one instance, tenants at Northcott campaigned for over ten years for the installation of a public toilet, after tiring of people using the park as a urinal. The tenants were so grateful for the installation of the toilet in 2008 that there was a formal opening with the Lord Mayor Clover Moore in attendance to cut the ribbon. It is now the most heavily patronised pay toilet in the City of Sydney Local Government Area. Social inclusion is one of the greater benefits of the open space provided by Ward Park. Tenants are able to socialise with neighbours and build a stronger connection with the wider community. There is much stigma attached to public housing and many a time a Surry Hills resident will be heard to pass comment on ‘them at Northcott’ as though the tenants there were a different breed of animal or had some kind of virulent disease. The interaction that happens between the tenants and other users of the park breaks down much of the preconceptions and prejudice toward public housing tenants held by the wider community. In early December 2013, Inner Sydney Regional Council for Social Development ran a series of consultations with the residents at the Northcott Public Housing estate, looking for input in to our submission on the South East Light Rail Project Environmental Impact Statement (EIS). The rail will run down Devonshire St, alongside a large part of the Northcott Estate, with a station planned for Ward Park. Depending on the position of their homes and way of thinking, tenants’ concerns were varied, from the loss of the tree canopy to the noise and dust a major development is likely to create. Yet there was one particular issue that united all the tenants we spoke to. The EIS outlines a proposal to use Ward Park as a compound to ‘accommodate a number of construction related activities.’ An area approximately 3200m2 of the park would be fenced off, for up to four to six years, to house an office, first aid room and sundry equipment. This compound would also require a number of trees to be removed, on top of trees already identified for removal to accommodate the station when built. The prospective loss of this open space has left the Northcott tenants and park users very unhappy. Ward Park is 9,500m2 with the two enclosed children’s playgrounds occupying approximately 2,000m2. After doing some simple arithmetic, it appears almost a half of Ward Park will be consumed. In fact, due to the particular lay out of the open spaces in the park and the planned location of the compound, a better guess-timate is that only a quarter of the open space will be left available for public use. The EIS states that the compound would mean “users of the park would be displaced, the types of activities suitable for the park altered and the general amenity of the park diminished.” In the best of locations the loss of such an open space amenity would be an unpleasant outcome, but at Northcott, where years of community development work has taken place to build a healthy sense of place, the loss of open space and social events is detrimental in the extreme. As the name of the suburb suggests, Surry Hills is hilly, with Northcott situated on the highest point. Topographically, this means for the aged and disabled tenants to visit local open green spaces, it requires a trek up and down hills and, for many, this is unmanageable. In fact, the closest open space, after Ward Park, is Prince Alfred Park, a 470 metre walk down (up on the return journey) a very steep Belvoir Street. While there is the abundance of research into the connection between our environments and mental health and wellbeing, the tenants at Northcott do not need academics to predict the effects caused by the loss of the open space provided by Ward Park. They’ve been through it before. The tenants recalled a time a couple of years back when the City of Sydney upgraded Ward Park. The process saw the major section of the park surrounded in cyclone fencing for over nine months while new turf was laid. The project had been delayed due to poor weather and other ‘unforeseen circumstances’ and as each week passed and the time that tenants had nowhere to walk their dogs, to exercise or to socialise with their neighbours lengthened, people spoke of a growing feeling of tension in the air. The tenants reckon it will go something like this. Some dogs will become more aggressive as their exercise regime reduces and are required to share small spaces with other dogs. The local street drinkers will gravitate to the spaces within the estate to drink, and whether it is a perception or a reality, people feel menaced by these groups, who as the day wears on and the flagons run dry, become louder and more likely to vocalise their sense of disenfranchisement with words that could turn a sailor’s ear red. The local kids, unable to tear around the grass and burn off youthful energy find less respectable ways to spend their time. The elderly return to the isolation of their units, bunkering down against the assault of noise creating by the dogs barking, people shouting and kids yahooing. Transport for NSW has claimed they will mitigate the impacts of the light rail installation as much as possible. A good start would be to use another, less vitally important, piece of land for a construction compound. With the open spaces within our cities ever diminishing, and/or demand ever-increasing as we build denser housing, it is imperative we protect the parks and recreational spaces available to us now. Charmaine Jones is the Executive Officer at Inner Sydney Regional Council and a tenant at Northcott. De Vries, S, Verheij, RA, Groenewegen, PP & Spreeuwenberg, P 2003, ‘Natural environments – healthy environments? An exploratory analysis of the relationship between greenspace and health’, Environment and Planning A , vol. 35(10), pp. 1717-1732. Weich, S., Blanchard, M., Prince, M., Burton, E., Erens, B., & Sproston, K. (2002). Mental health and the built environment: cross-sectional survey of individual and contextual risk factors for depression. British Journal of Psychiatry, 180, 428-433. http://bjp.rcpsych.org/content/180/5/428.full.pdf ?